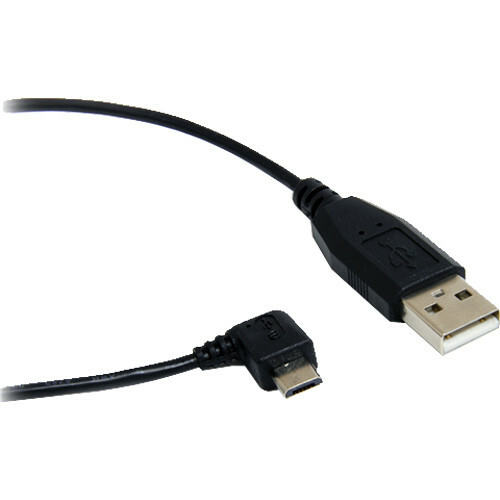 The black USB 2.0 Type-A Male to Right-Angle Micro-USB Male Cable from StarTech is 3' long and transfers data at a rate of 480 Mb/s between your micro-USB devices and computer. It features one USB Type-A male connector as well as one right-angle USB Micro-B 5-pin connector, which allows the connected USB peripheral to be positioned nearly flush against a wall or other surface. This design eliminates the space that would be required to accommodate a typical straight cable. Moreover, you can use this cable to charge a smartphone or provide power to a portable storage drive. Box Dimensions (LxWxH) 9.0 x 5.0 x 0.5"
USB 2.0 Type-A Male to Right-Angle Micro-USB Male Cable (3') is rated 4.9 out of 5 by 12. Rated 5 out of 5 by Char from Perfect My phone plugs in at the bottom and straight cords get damaged easily because they take abuse from the car mount and holding the phone as the cord is jammed against whatever is under the phone. Side mount phones are better but for those who don't have them, the angled cord helps. Rated 5 out of 5 by Anonymous from USB cable Looking for something that would charge my new tablet but not be in the way, this fits the bill completely. Don't have to worry about knocking the plug out of the port, it hugs the side of the tablet. Rated 5 out of 5 by Geoffrey from Great solution to cable connection Charging my cell phone in the car was a problem because the normal connector would stick out too far and not allow the phone to be in a holder. The solution to the problem is this cable. With a 90 degree turn it minimizes the space needed when connected to the phone. Rated 5 out of 5 by Keith from Fantastic Have been looking for this for a while -- low profile and reduced the chance the port gets stressed from the plug catching on things. I have bought multiples of these, I am that pleased with them, along with the left hand version as well. Rated 5 out of 5 by wboykin from Great Cable The cable is excellent. The heads are firmly attached to the cable and the cable itself is reasonably flexible. I am very pleased with this. The only drawback is that it is not USB3.0. Rated 5 out of 5 by Alonso from Angled Micro USB cable I use this cable to charge my phone with no issues. The end connectors aren't unnecessary bulky either, which is a plus. Rated 5 out of 5 by Javier from Excellent! thin but does the job. Rated 5 out of 5 by Jaimin from its good and cheap. my ablate charger wire was not working so i have bought this wire.its very good and affordable price.